You know that bad boy parents always warn their daughters about? The one who broods and sulks and skulks and just isn’t nice enough to be brought home to mother? Well, Once Upon A Time in Mumbai is that bad boy – it’s crude, it’s rude, it’s really kind of sleazy, and certainly not fit to have over for tea and scones. And still, somehow, like all bad boys, it endears, and you find yourself letting it in through a back window anyway. In a way, director Milan Luthria’s grungy Mumbai netherworld saga is an anti-dote to the Yashraj brand of overly silky smooth mush fests that seems to have taken over Bollywood in the new millennium. Like Company and Shootout at Lokhandwala before it, Luthria’s film tries to get at the grit and murk that line the underbelly of the metropolis, which the Raj-and-Simran romances studiously avoid acknowledging. Writer Rajat Arora’s winning hand lies in his decision to base the story in Mumbai circa the 70s, when the city’s mob scene was really emerging into the light of day, and also when Hindi films themselves started taking note of and exploring that scene. Much has been made of the story’s likeness to the real-life turf struggles between notorious gangsters Haji Mastan and Dawood Ibrahim, but even without that connection, it’s an interesting set-up, taking as a backdrop a time when (at least cinematically) men were men, with an abundance of facial hair and a perpetual itch to prove their manhood by shoving their women around and indulging in brawls on a regular basis. And the women? Well, they were on hand to be shoved around and to play the grieving widow when their gangland paramour bought it at the hands of either the police or a rival. 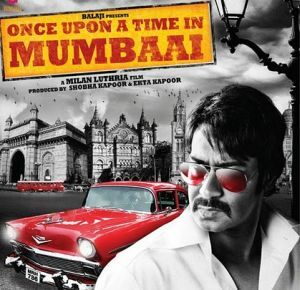 OUATIM tells a familiar tale, of the rise of the ‘gentleman gangster’ Sultan Mirza (Devgn), who rules his land with smarts, not brainless brawn, and who romances Hindi film superstar Rihana (Ranaut). Enter Shoaib Khan (Hashmi), Mirza’s amoral, hot-headed, punch-first-think-later antithesis who starts out as his henchman, but is soon dreaming bigger and bloodier. Caught in the middle is ACP Agnel Wilson (Hooda), who thinks he can use Khan to bring down Mirza’s reign, but who clearly overestimates his power over the dynamics between the two outlaws. Interestingly, it is not the real 70s that the film takes great pains to recreate, rather, the filmic representation of that iconic era. Luthria himself has acknowledged the debt his opus owes to the 1978 Chandra Barot gangster classic Don, and the influence is more than evident in the look of the film – from the dark, smoky ambient effects and the bouffant hairdos and flared trousers, down even to the way the walls of a warehouse are painted. The thumping background score by Sandeep Shirodkar, which adds quite a punch to the goings-on that are nicely shot but sometimes clumsily put together, is also more of an homage to the era rather than a slavish duplication of its musical notes. The downside to the proceedings is of course that this sort of story has been done before, so there are no real surprises as far as the narrative goes. There are pacing problems in the script, and the dialogue at times suffers from overuse of clichéd idioms. But the black sheep always has redeeming qualities, remember? Apart from the impeccable construction of atmosphere that signals the creation of a whole new Bollywood sub-genre – the ‘curry urban’ – there is Devgn, reliably moody and intense as always. But it is Hashmi – the much-ridiculed ‘serial kisser’ of B-grade Hindi cinema – who is the real surprise here. With his powerhouse turn as the quasi-sociopathic hoodlum Khan, the actor seems to have found his niche. He ain’t no lover boy after all; he’s been a character actor all along, and props to Luthria for discovering that. So if you’ve had an overdose of treacle romances and chocolate heroes, you could give this clay-footed bad boy a chance. Interesting to see that you didn’t mention Hooda- apart from Hashmi, this film really made me (and according to media reports, other moviegoers) realize how brilliantly subtle Hooda can be. The reviews are originally printed in the monthly Herald, and sometimes the word limit dictates that I leave out stuff that would otherwise be in there 🙂 And I agree, Hooda is one to watch for.